The team was delighted to give a tour of the 3D textbook to some local businesses today. 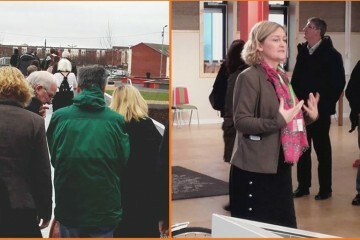 The CEO, Sarah Miller, talked them through the history of the building and to show how it has gone from a building that was once so close to demolition to a building that is now one of the most unique buildings in Europe. Every aspect of the repurposed Boiler House has been created with reuse in mind. Sarah walked them through the 3D text book as she discussed the importance of reusing materials from the old building in the new construction. The reuse is evident from the steel beams, to the concrete floors and to some of the art installations.